A huge barn fire which raged on the outskirts of Falmouth last week is being treated as suspicious. The fire, which took 12 hours to put out, was reported at around 9pm on the evening of Friday 22 February. Fire crews from Falmouth quickly arrived on scene but were soon requiring back up. At the height of the incident, there were almost 50 firefighters on the scene. Students from Falmouth University saw the fire as they were driving from Penryn Campus back into Falmouth town. On arrival at the farm, the group realised that the owners were unaware of the blaze destroying one of their barns. 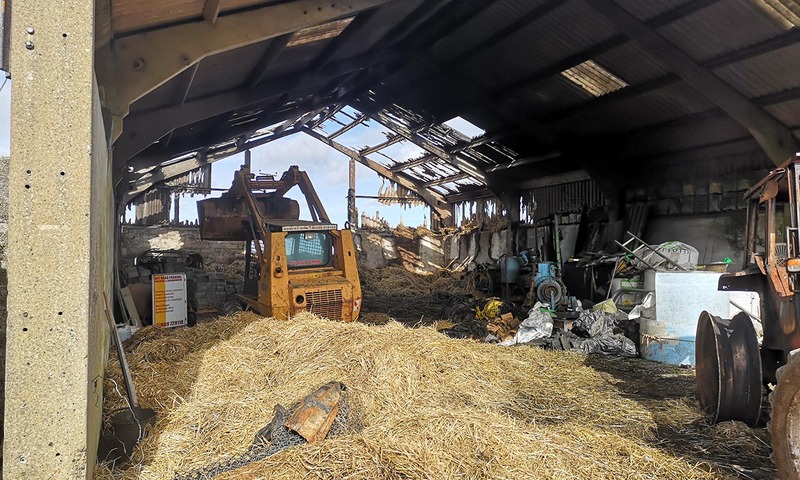 The aftermath of the fire at Tregonhay Farm. The incident is being treated as suspicious and an investigation is ongoing. Two other fires were reported around Cornwall on that same evening, necessitating the services of almost 100 firefighters over the course of the night. Anyone with information relevant to the incident is asked to contact police on 101 quoting CR/016662/19.